In this time-constrained world, we don’t have a thousand words to explain to hiring managers, potential clients, colleagues or future bosses who we are as professionals. Instead, let your photographs do the talking. I’m not talking about pictures of after-work tequila shots and bikini vacation photos in the bars. Keep those far, far away from the Internet because you just never know who is going to see those photos and how they might affect the way people perceive you professionally. But the right picture is worth a thousand words if you can use it to reinforce your brand and build professional relationships. Upload examples of your work to show your talent rather than just talking about them. Talk about a professional goldmine! When you use photographs to exemplify your work and stand out from the crowd, they pack a punch. In fact, members who share images with their LinkedIn network are five times more likely to have other members engage with their update. Clicks and pics can be a recipe for professional success. Conferences, networking and professional development events: Show your network that you take your career development seriously. Photos not only help you get credit for investing in yourself, they also provide you with an opportunity to share key learnings with professionals who weren’t able to attend an event. If you’re at a conference, snap a shot of the speaker and pop one of their quotes in an update. View from your desk: Photographs that capture ‘a day in the life’ are often even more meaningful than basic job descriptions. Bring the passion and energy that you have for your career to life. Use photographs to capture fun, inspiring or motivational moments throughout your day. Whether it is the view from your desk, a photo of your awesome team in action, a shipment of beautiful flowers or the latest new product you’re stocking the shelves with, capturing these moments helps you remember your work day highlights. It is also a way for other professionals to see what a day in your career is like. Show off your talents: The only thing better than telling a client, hiring manager or boss how talented you are, is to show them. If you are an interior designer, show the remodel you’ve been working on. If you’re a hairstylist, proudly show off photos of the latest up-do you created. Dog walkers and veterinarians can snap photos of happy “critter clients” with their pet parents’ permission. If you’re a yoga teacher who just redesigned your new studio, snap a picture and share your new digs with your network. Professional selfie: How important is it to have a photo in your LinkedIn Profile? The answer is extremely. A profile with a photo is 11 times more likely to be viewed. Rather than using the typical headshot, try having someone take a shot of you in the midst of your work – during a presentation or practicing a big speech - or even in front of oven in your kitchen whites if you’re a chef! Or turn the camera on yourself. If a client or potential employer can really see you in the context of your work, it creates an equation that looks something like this: YOU + TALENT = OFFER/OPPORTUNITY. What will the first photo you upload be? 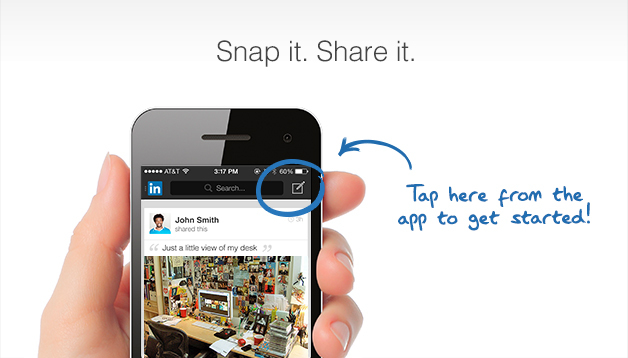 Don’t delay, start snapping shots and sharing them with your network. Photo credit: Don Clark at Invisible Creature.